Everybody loves Dave. How could you not love that two eyed, yellow Minion? He is just so…huggable. You just want to hug him, and squeeze him, and call him George. Err, Dave, call him Dave. But huggability aside, he is a pretty fun guy. Dave knows how to party. Just watch Despicable Me 2, you’ll see him enjoying the beach life with a coconut drink in one hand, and a banana in the other, running into the water, generally enjoying life. And that’s not even taking into account his ingenuity when it comes to gifts. Agnes wanted a unicorn, and a unicorn is what she got, kind of. Your daughter LOVES that movie. Yes, capitol letter ‘loves’. It is all she talks about. And this Halloween she wants to be Agnes. Meaning you really only have one option for who you are going to be. Yep, that’s right, good old Dave the Minion. He is her favorite, and you can see why. 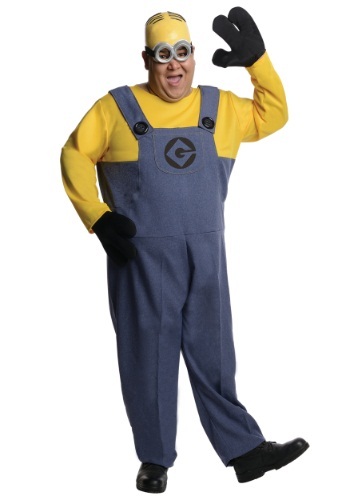 This Plus Size Dave the Minion costume will make her year, and you could pick up a fart gun from the local toy store (you know, just to “complete” the look). She will be running up, and down the street, hair bouncing around on top of her head, with her striped yellow shirt, and overalls with uncontained joy. And when she rings the door bells, and says “trick or treat” she will introduce you to the neighbors as “Dave, the Minion. And I’m Agnes!” as she gives your leg a big hug.